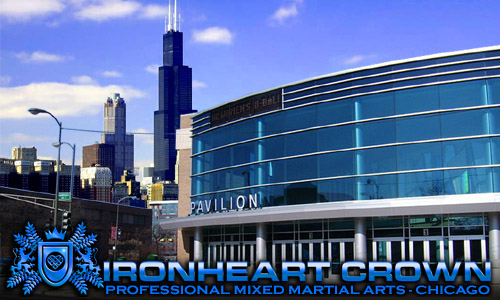 The Ironheart Crown is Chicago's number one stage for world-class, professional mixed martial arts competition. Every show features 10 - 15 exciting matches between highly skilled athletes trained in a number of fighting arts. This is not an entry level competition and we do not host amateur matches. Our event is much more than a local show. While most of our participants hail from the Midwest, we also import athletes from across the United States, and sometimes abroad. We have featured fighters from as far off as California, North Dakota, New Jersey, Hawaii, and Florida and have also brought in talent from Canada, Brazil, Finland, and Sweden. 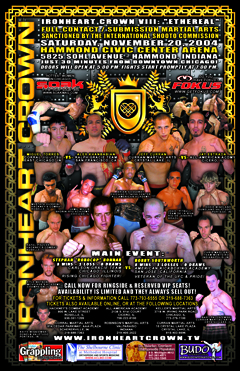 The Ironheart Crown goes to any length and spares no expense to produce the most exciting and dynamic matches possible, making the event a high-end showcase of athleticism worthy of a Las Vegas stage. 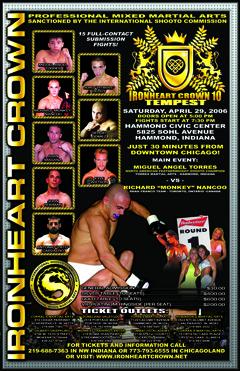 The Ironheart Crown was founded in 1999 by Dr. Eric Moon. Now a practicing Emergency Physician, Dr. Moon is also a former competitor himself. The inaugural event was held at the St. Andrew's gymnasium on Addison in Chicago. 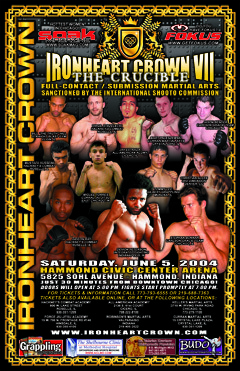 Our first two shows were held in the Windy City making the Ironheart Crown the area's oldest ongoing mixed martial arts promotion. From these humble beginnings, the Ironheart Crown quickly grew with a gradual but steady increase in both attendance and production quality. Even in its infancy, the Ironheart Crown was widely regarded as the best show of its kind in the city of Chicago. By 2001, the Ironheart Crown had outgrown its original arena. At the time, the show was still maturing and not yet ready for a bigger venue within the city limits. Because of this, the show was moved over the border into Hammond, Indiana where it continued to thrive. Within a few years, the show was attracting thousands of fans with each production, making it one of the Midwest's largest events at the time. The size of the event and the quality of the featured matches began to attract national and international attention. 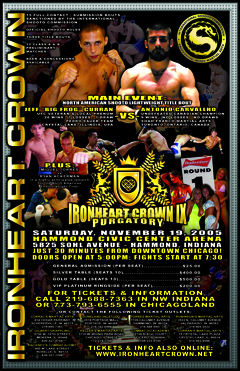 While in Hammond, the Ironheart Crown was featured in numerous national and international publications and even aired on TV in Japan, as well as here locally on Comcast Sportsnet. Eventually, the show was noticed by Rich Santoro, the U.S. commissioner for the International Shooto Commission. Mr. Santoro was so impressed with the show that he met with the promoters to discuss sanctioning the show. 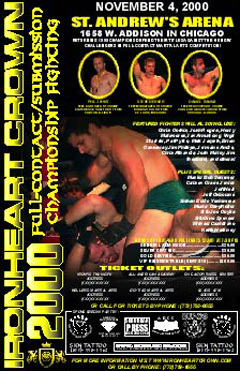 From that point on, the Ironheart Crown became the top stage for Shooto competition in North America, and many of the first Pan-American Shooto champions earned their titles within our ring. For more information about the Shooto commission, please visit our Shooto page. 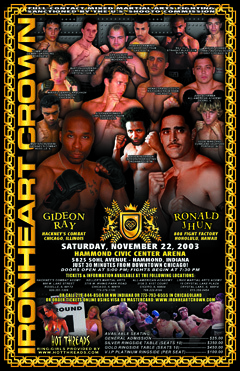 By 2008 the Ironheart Crown had become one of the most prestigious mixed martial arts competions in the nation, and its fanbase had increased to the point that it was now ready for its return to the City of Chicago. The UIC Pavilion was determined to be the perfect venue, and arrangements were made to host the show there. With the move back home, a number of changes were made in the production, including a switch from the boxing ring to the industry standard cage. With this change, the Ironheart Crown had to forfeit its sanctioning under the Shooto organization which requires that matches be held in a traditional boxing ring. 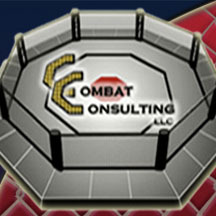 While the Ironheart Crown will continue to host infrequent Shooto matches held in a ring, it is now predominantly a cage-based show sanctioned by Combat Consulting, a local mixed martial arts sanctioning body. The show will also be held under the auspices of the boxing division of the Illinois Department of Financial and Professional Regulation (IDFPR), and there are plans to establish an affiliation with the American Fight League (AFL), a nationwide governing body. As always, fighters will continue to be screened by a detailed history and physical exam conducted by a licensed physician. Medical clearance will include mandatory blood work and testing to document every competitor's fitness. Furthermore, all matches will be overseen by a ringside medical team consisting of a minimum of one licensed physician and two paramedics. An ambulance will also be on site and ready at every show.